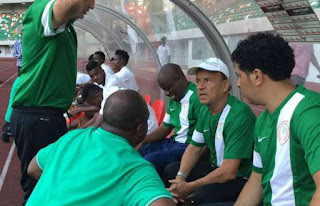 Technical Adviser of the Super Eagles, Gernot Rohr, has hailed his players, after a 3-1 win over Algeria on Saturday in Uyo, Akwa Ibom state . Victor Moses scored twice for Nigeria, while captain John Mikel Obi also netted, as the Eagles extended their lead at the top of the African qualifying Group B.
Nigeria now lead the group with six points. Cameroon have two, while Zambia and Algeria have one each. “We had a great first half but the second half was difficult,” Rohr said during his post-match press conference. “The players are changing, they are accepting our philosophy. We want to play fast, attacking football and we’re getting there. Rohr was also happy that the team kept its composure and defended well against key Algerian players. “We defended well,” he added. The German however warned that there was a long way to go, before Nigeria qualifies for the next World Cup in Russia.